Oh my oh my. Martha Stewart. Just when I was ready and set to give up on you. Just when I felt like every recipe in your magazine required the purchase of either (a.) a new specialized baking dish or kitchen utensil or (b.) a farm in New Hampshire, you came through for me. In the May issue of the magazine is the feature "Lunch in the Garden," in which Dana Gallagher rewarded several of her friends for helping rescue her weedy garden by serving them a delicious lunch that she made largely with the fruits of their own labor. It was another one of those serendipitous moments for me. 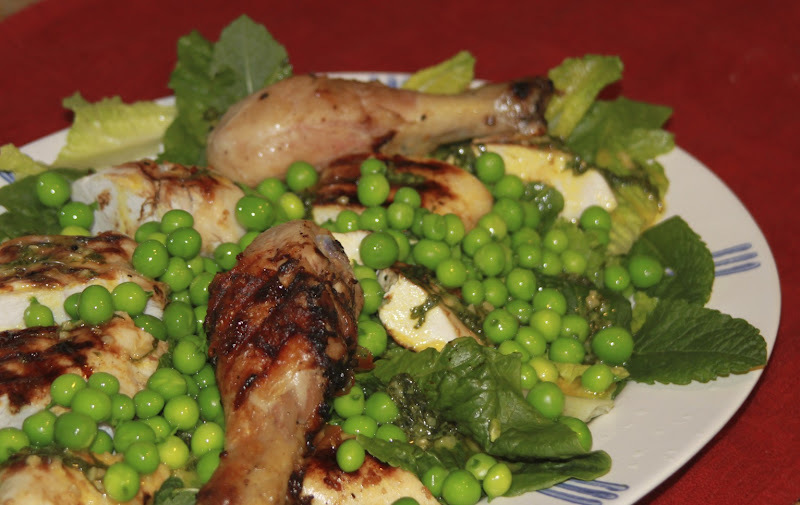 I was leisurely leafing through the magazine, just about to quit my Martha habit cold turkey, when I spied the recipe for the Grilled Chicken Salad. It listed several ingredients that happened to come in my box again this week (thanks be to seasonal cooking once again! Dana Gallagher's garden and the Abundant Harvest Farms both seem to have produce that understands it should be ripening right now. Those smart little veggies.). 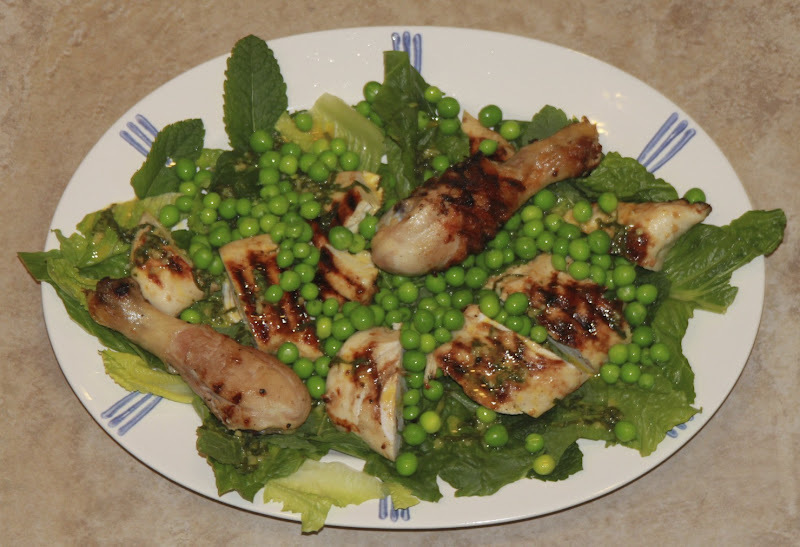 Lettuce, peas, mint, lemon? I've got that! This recipe is really easy to put together, especially considering lots of it can be done ahead of time. If you've been around here for very long at all, you know I love something that can be done ahead. There just isn't time between school and karate class and baseball practice and piano lessons and scout meetings to really dedicate any length of afternoon/evening to the kitchen. 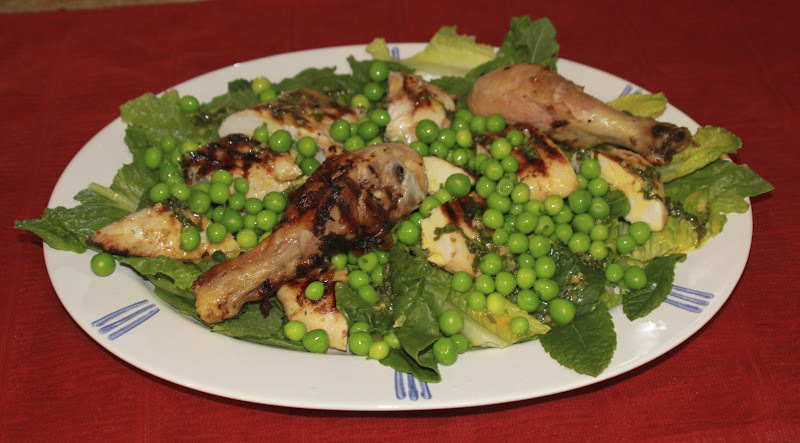 This salad let me marinate the chicken in the morning, grill it while I cleaned the veggies and whisked up the dressing at lunch time, and throw the salad together just in time to intercept the starving family as they zipped though my dining room. The chicken can actually be cooked at any time during the day and kept refrigerated until showtime. I sat at dinner and ate and ate and ate until I was uncomfortable (which has been pointed out to me, isn't easy to do with a salad). It was just so delicious that I couldn't stop! I didn't know how I was going to feel about mint in my salad, but it was amazing! I am hoping to get more peas right quick so I can make this one again! Here is the recipe just how Martha presents it. The only substitution I made was to use Romaine instead of butter lettuce. I think the butter lettuce would have been even better, but Romaine was what I got this week, and so Romaine is what I ate. I also cooked a little less chicken (feeding only five, rather than the 20 or so that seemed to be at the featured garden party). I loved that it called for both legs and breasts. The kids love eating chicken drumsticks!